On days when my responsibilities pile up and my workload is heavy, I often find comfort in watching my children play in our backyard. Watching them joyfully run around the trees and seeing them happily soar on the swings always makes smile. Even though a bit of play would be a great personal stress reliever, I always stop short of wishing I could be a child again. Why? Because being a child in today’s world is hard. Rampant violence threatens our children’s lives. Sexist and racist attitudes seek to impose limitations on our children. Bullying threatens our children’s self esteem and fosters feelings of fear and isolation. Social media has ushered in a new age of digital peer pressure, encouraging children to seek shallow fame and conform to unhealthy standards. In order to survive in today’s world, children must have attentive parents who work hard to raise healthy, capable, well-educated, and confident boys and girls. We must spend quality time with our children, teaching them to love their brown skin and celebrate their rich heritage. Here are seven things you can do, TODAY, to teach your children to love themselves, just as they are. Teach your children to be themselves. In our home, my husband and I teach our girls that they are wonderful beings created by a loving God. We teach them that God did not err when He created them and that they must be themselves. That means our children must be taught to embrace the beauty of their curly hair, see the artistry in their full lips, and recognize the allure of their brown skin. Teach your children to celebrate their uniqueness and discourage them from wanting to fit into another’s mold. Help your children discover their gifts and talents. We teach our three daughters that they have been born with amazing gifts and special talents. We renin d them that these gifts are to not be ignored, squandered, or taken for granted. Study your children to learn more about their gifts and talents. Ask them questions about the things they enjoy. Once you discover those gifts and talents, introduce your children to opportunities and activities that will help them hone their gifts. Teach your children that outward appearance does not define who they are. Our world has an unhealthy obsession with physical appearance. Unfortunately, height, weight, skin tone, bust size, and muscular build have become the criteria for acceptance. We must remind our children that who they are inside is vastly more important than how they look on the outside. Outer beauty fades, but true inner beauty does not dim. Martin Luther King, Jr. reflected such sentiment in his I Have a Dream speech, Martin Luther King, Jr. when he spoke about the content of one’s character. We must teach our children to develop integrity and remind them that their character provides a true definition of who they are. Show your children you love them. The words I love you are spoken in our home several times a day. Our girls hear it from my husband and me regularly, but we know that true love does not come from words alone. Love is a verb; it is an action. We must show love to our children by talking to them, by helping them, by encouraging them, and by spending time with them. Being with our children shows that we love them and opens the door to meaningful conversation. Help your child find friends who will encourage and uplift him. Friends influence how our children think and behave. This is why it is important for our children to have friends who encourage and uplift them. Does this mean our children should only have African-Amerian friends? Certainly not. It merely means that our children’s friends ought to be children who accept them as who they are and encourage them in their efforts. Teach your children about their African-American heritage. Teach your children about their African-American heritage year round and make African-American history an integral part of your homeschool studies. Introduce your children to African-American pioneers in each of the subject areas. Read books about the accomplishments of fellow African-Americans and study literature written by African-Americans. Find an African-American who successfully uses a gift or talent your child has and interview that individual. In spite of all we do, there may be times when our children cannot see their own beauty and reject themselves. When those times occur, we have to serve as a mirror for our children by reflecting and reminding them of how special they are. Using picture books featuring African-American children is often a helpful strategy to help reinforce a positive self image. It is possible to help our children adopt the attitude needed to proudly accept who they are. However, it does not happen without purposeful parental intervention. Make time to pour love into your children and plant seeds of healthy self-esteem within them. 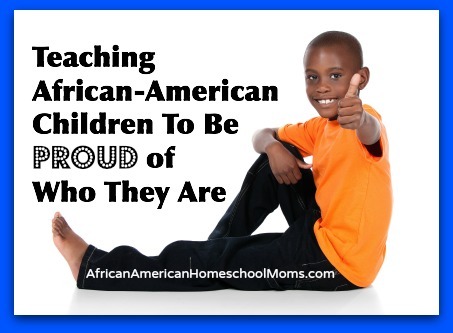 You’ll be helping to raise a generation of proud, well-educated, confident African-American children!